T onight I have to make this a snappy post because I still have a few things to pack, and I have to get up early tomorrow morning to move. I'll update about our new place as soon as I can. Hopefully we won't have any internet difficulties. That's my worst nightmare. Friday we signed the lease and moved most of our stuff over, but tomorrow is the actual big moving day. I'm excited! Anyway, so today was my sister, Kristin's, baby shower. It was a lot of fun, but I had no idea how much work goes into them. Food, cake, punch, decorations, games... My poor mom and sister Rachel. They worked so hard on this shower. All I did was make cupcakes. Yowza. There's a baby in there. Hello baby! I can't wait to meet you. Here's some of the food. 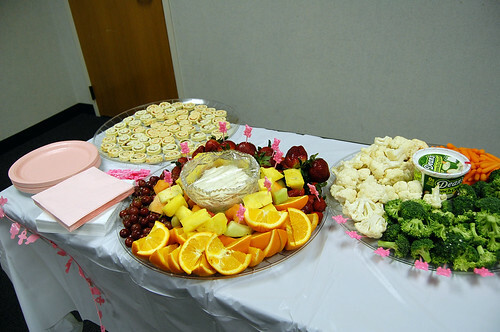 We had veggies, fruit, ham roll-up thingies, mints, nuts, punch, and mini quiches. I have to tell you something you don't know about mini quiches. Okay, okay, so you know how good those things are, right? How many would you eat? Maybe four? Or more? Guess what. There's five grams of fat in one mini quiche. Can you believe that? Those are dangerous! I think maybe we should have written the nutrition facts on a little card and placed it in front of them. Strawberry punch. No booze. Oh, and white cake... I was informed a few days ago that someone else was bringing a cake, too. Hmm. I ate this. 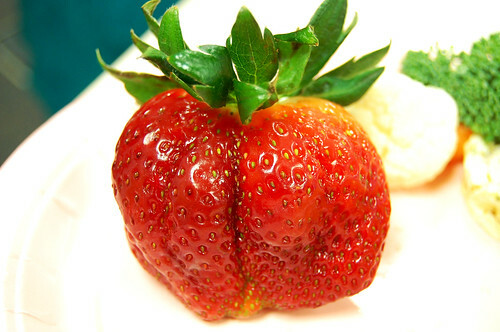 It was a strawberry the size of my fist. These are my cupcakes on display. I love that rack! I need to invest in one of those. This is the center of the cupcake. Cheesecake filling. Mmm. Presents. Lots and lots of presents. It took my sister an hour to open all of them. These are little gift boxes that my sister Hannah made. She made forty of them and people forgot to take them home when they left. We played some games. Baby animal guessing, and nursery rhyme games. 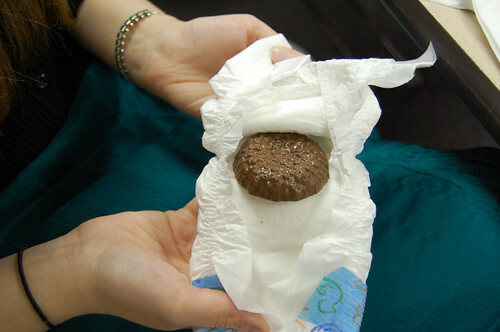 Then we played this game where you had to guess what kind of melted candy bar was in the diaper. I didn't know this one. Do you? So that was the shower. I just realized I don't have any pictures of myself, but that's okay. I was the one taking all of the pictures. I don't like having to ask people to take my picture. I guess I need to get over that though. These cupcakes are basically the devil's food cupcakes, but a little bit improved, I believe. They have a cheesecake filling composed of cream cheese, egg, sugar and graham cracker crumbs. Then they're topped with the same chocolate frosting. VERY rich, very delicious. 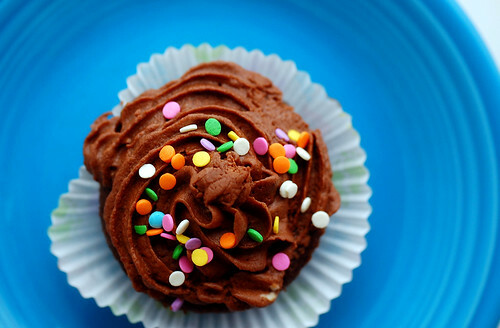 The ultimate cupcake? I think so. More "Ultimate" news coming later this week. To make the chocolate cake, in a medium sized mixing bowl, sift together flour, cocoa powder, baking powder, baking soda and salt. In a large mixing bowl, using a mixer on medium speed, beat oil, butter, granulated sugar and vanilla, until creamy, about 2 minutes. Beat in eggs, one at a time, until well combined. Beat in melted chocolate chips until combined. Reduce mixer speed to low and beat in flour mixture, alternating with buttermilk, until well combined, about 2-3 minutes. To make the cheesecake filling, in a medium bowl, using a mixer on medium speed, beat cream cheese and granulated sugar until creamy - about 1-2 minutes; beat in egg and vanilla until well combined. Stir in graham cracker crumbs until combined. Divide 1/3 of the batter into muffin cups. Place a spoonful of cream cheese mixture into the centers; cover with remaining batter. Bake 17-19 minutes, or until just set, and a toothpick inserted into cake comes out with moist crumbs attached. Cool for 5 minutes before transferring to wire racks to cool completely. 56 comments on "Chocolate Cheesecake-Filled Cupcakes with Chocolate Frosting"
Cheesecake filled cupcakes? That's awesome. you can never have too much cake (esp if it's as delicious looking as all the things you bake)! 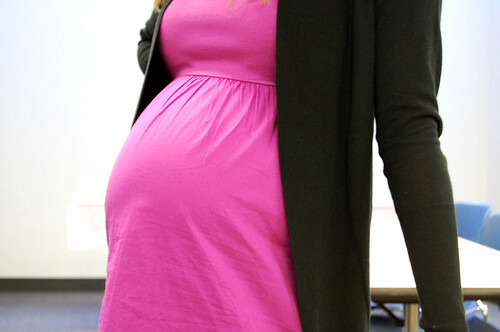 wow that is quite a baby bump! congrats to the mama to be! What superb looking filled cupcakes & what a baby shower!! Yeah!! You did an outstanding job, Emily!! What a lot of presents too! Ooh, looks deliciously decadent. Loving the cheesecake centres too! So, I'm thinking with all the pink that you are going to be getting a new niece soon! Best wishes for a happy, healthy baby. I really want to try 'fancy' cupcakes some day. These look awesome. Good luck on the move and I can't wait for the 'ultimate' news too. These cupcakes look delicious! Oh my, I want one. So cute! 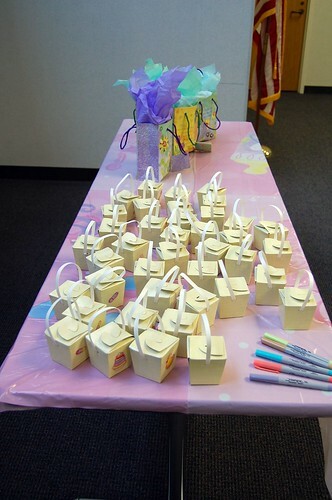 Makes me want to have a baby just so I can eat all afternoon long at my baby shower, ha! yeah good luck with the move. our move into our new home was a nightmare with the internet. they screwed it up so badly AND changed our phone number, plus we lost the old one. (I run a business too). oh what a nightmare. my best advice, if you use COMCRAP make sure you call them way ahead of time and tell them you are moving, then call them again in a day to confirm and make sure all is FINE. OY! these look so delicious, I have to make those! I hope this isn´t a stupid qestion but what are graham cracker crumbs? Hope you can help me! thank you very much! Please make a separate one sentence post about voting for you on Saveur. Don't hide it in the middle of talking about cupcakes! How can people focus?!! You didn't play the hold-a-baby-in-one-arm-with-the-phone-in-the-other-while-you-take-clothes-off-a-clothesline-and-hang-them-back-up game??!! The last shower I had for a friend, it was the amazing mother of SIX that won that game. Of course, she did. Great cupcakes. Your description of "doneness" is perfect. I'm to the point in my life where there will soon be baby showers again-all my friends children and nieces and nephews having babies. Yikes! But now I will have a new recipe to try out on them besides salad, pickle wraps, veggies and dip! These look great! The cupcakes look delicious. I love mini-quiches.. and haven't never seen the melted chocolate in the diaper game, wow. Cupcakes look amazing. I would so choose one of those over white cake...although I'd probably be too full of mini-quiches for any dessert. Love those things! My guess for the candy bar poo - Nestle's Crunch? 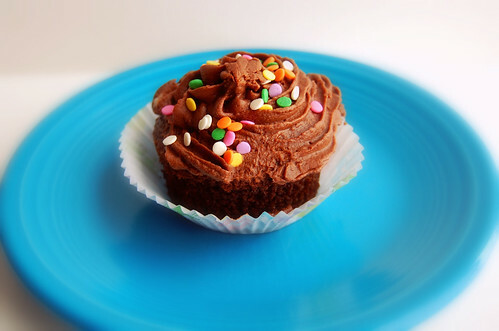 Mmmm delicious chocolaty cupcakes...my favorite! I love the cheesecake surprise in the center....yum! 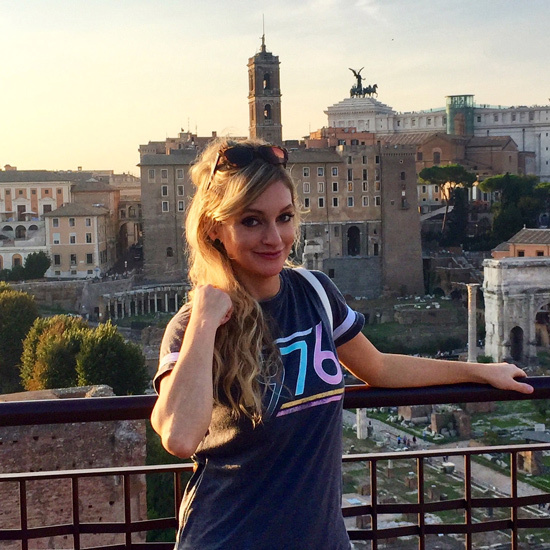 Your blog entries always make me happy! So thank you. 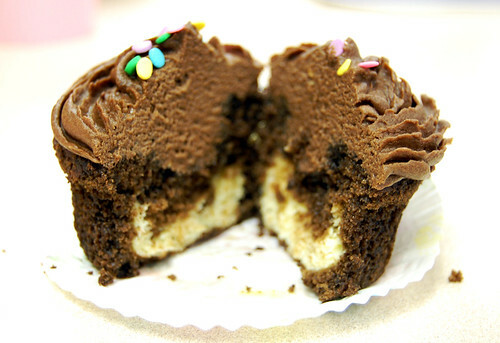 Question: When you bake with semi-sweet chocolate chips, which brand do you prefer, particularly for these cupcakes? Great job! I find it hard to believe that you have to have alcohol to have fun! You sound like you have a lot of fun a lot of the time, I don't think you are tipsy 24/7. Those look soo good!! If it wasn't 11pm on a Sunday and my kitchen wasn't finally clean for the first time since I got sick I would go make these right now! They look that GOOD!! Have fun moving tomorrow!!! That's always so stressful! 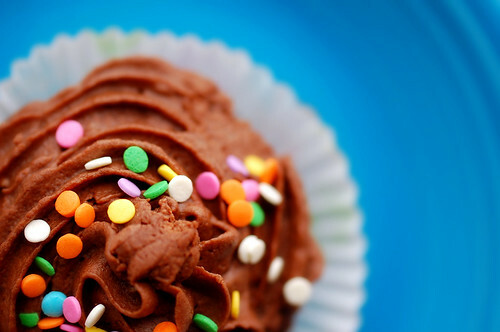 I'd go for the chocolate cupcake over white cake anytime (though the cake is very pretty)! Yummmm - your cupcakes look awesome! great cupcakes, emily--it seems like there are always oodles of goodies at events like that, but your creation is what i'd be making a beeline for! 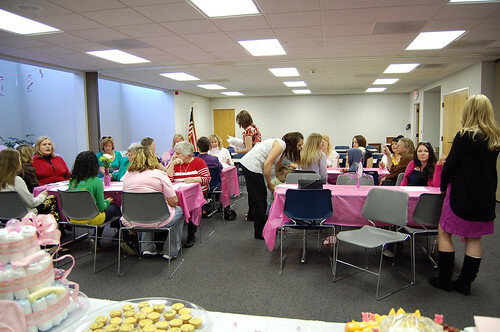 Great baby shower, great food and delicious cupcakes. Looked like everyone had a ball of a time. Oh baby showers are so much fun. Your cupcakes look delicious and I just love the display!!! A niece or nephew how exciting. They will never want for delicious sweets that's for sure if Aintie Em has anything to do with it. These cupcakes look awesome and I'm sure made your sister and the baby very happy. The shower looked really nice, I hoped you had a good time too! Of course mini quiches have 5 grams of fat. That's why they taste so good. I'd rather eat my fat grams on your cupcakes though. Although your cupcakes have no fat in them, right? "Boy the way Glenn Miller played. Songs that made the hit parade. Guys like us we had it made. Those were the days..."
Too funny! I also went to a baby shower on Saturday, and I was also in charge of cupcakes! Yours look super yummy. I wish we could swap cupcakes through the internet. Sigh. I have to admit that I hate that diaper game. i've always thought it was really gross. But the cupcakes - that's what I'd go to first! but at least they got to taste your yummy cupcakes! MMM, I love devils food cake as cupcakes. It makes it less rich thus making way for the GORGEOUS frosting and in this case, the super awesome cheesecake filling! That cupcake look like heaven! How fun! And the cupcakes look delish! The cupcakes look delicious! You can't beat the taste of chocolate and cheesecake! I can't wait to try them. I have never heard of the melted candy bar in the diaper game. What a hoot! nope not into baby showers but the diaper thing looked cool. That can only be the altered state of the famous Cherry Mash bar!!!! Congrats to your sis! How sweet of you to make her these gorgeous cupcakes! The filling sounds so yummy. This kiddo will be so lucky to have an aunt who makes tasty treats! Post pics of the new place when it's furnished, when you can! Anyways, thanks for writing a wonderfully entertaining food blog! These cupcakes sound divine, I will definitely have to give them a try! Aww how fun! Congrats to your sister! The cupcakes look amazing. 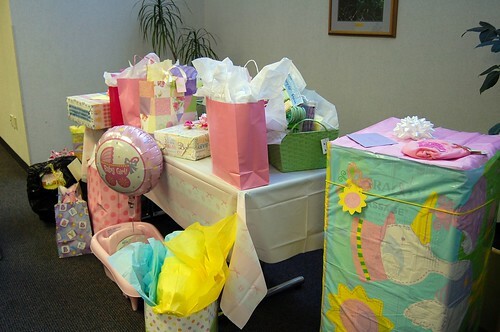 The baby shower looks like fun and look at all those presents! Your sister must have loved it. And your cupcakes look wonderful. 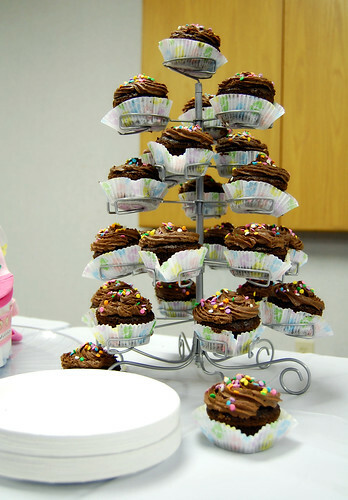 I adored that cupcake tower! Now as to the diaper poo. Never heard of this game. Funny! Don't have a clue what it is. Sad that everyone forgot to take home their party favors! I love the cheesecake center in these, my favorite kind of cupcake. Hopefully the move went well! 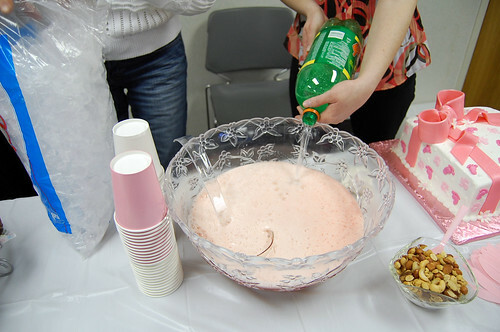 The baby shower looked like tons of fun! I made these cupcakes yesterday and let me just say that, girl, you know what you are doing! These cupcakes were a little piece of heaven. Keep giving us more recipes!! Those cupcakes look heavenly! I wonder how you always come up with such great recipes! i haven't actually made cupcakes before but i decided to make these for my mom on mother's day. they turned out AMAZING! everyone loved them, including me. thanks for all your recipes...i love your blog! Oh! I know what that candy is in the diaper game lol. It looks extremely similar to a Coconut Nest from Russel Stover. I worked at a Hallmark store for a long time and we sold these at Easter time. They're delish. I tried these out for a chocolate-lover's birthday party. They were a hit, but I have to say - the frosting is out of this world delicious! More people wanted the recipe to the frosting than the cupcakes!! I made these a while back and have made varied forms of these since. Seriously this is one of my all-time favorite desserts! Thanks for the recipe! The candy looks like a russell stover coconut egg!! Can you just make the cheesecake mixture and insert it in the cupcake after it has cooked and cooled with a small round icing tip?